Creative Designs is a full service wedding and party design firm focused on creating an experience for you and your guests. Your inspirations are our foundation for designing your special day. 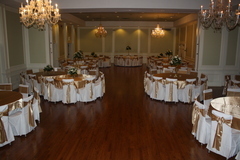 Linen Rentals is our specialty and event planning is our obsession. Embracing this attitude allows us to be a linen rental company set apart from the rest. We offer professional experience and customer service that will leave you feeling assured in knowing that we are here to take care of you.